Gummy Watermelon Slice: A hefty hunk of watermelon-flavored gummy. Enjoy the delicious taste of watermelon whether it’s porch season or jacket weather by biting into a Gummy Watermelon Slice. This candy is superbly detailed like a sizable slice of the summer fruit with an unbelievably authentic watermelon taste to match. But unlike the real fruit, you’ll cherish the seeds and rind which have their own tasty fruity flavors. Weighing in at over a pound, Gummy Watermelon is a blue ribbon-worthy treat that’s always in season. Gummy styled and flavored like a piece of watermelon. Please note that we have removed the stick since this video was made. We figured that real watermelon slices don't come with sticks, so our gummy version shouldn't either. 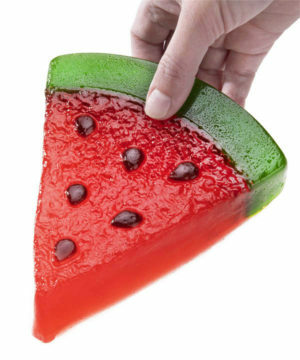 The Gummy Watermelon Slice looks so realistic, you’ll feel like you’re eating the blue ribbon winner at a county fair. The textured surface, raised seeds, and bright coloring provide a fun visual similarity to the fruit, and the taste is a delicious match. Enjoy; just don’t spit the seeds. The makers of the Gummy Watermelon have successfully recreated the look and taste of a delicious, ripe watermelon... with a couple of tasty exceptions. Instead of a bitter rind-flavored rind, the green part of the gummy melon is a tasty sour apple. Combined with the grape flavored seeds, you get three flavors of gummy in one hunk of candvy fruit. 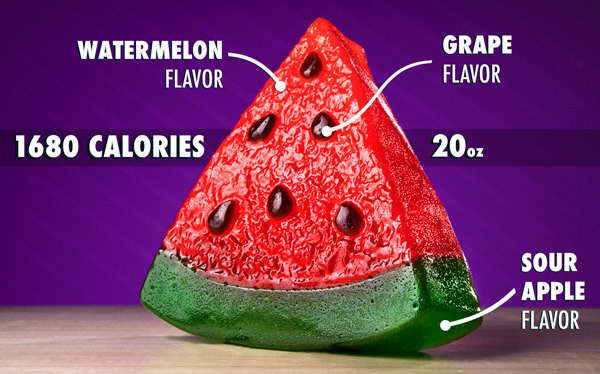 Weighing in at over a pound and bursting with 1,680 Calories of chewy goodness, you’ll find that a slice of Gummy Watermelon is enough to feed your whole picnic. It was a bumper gummy crop this year. 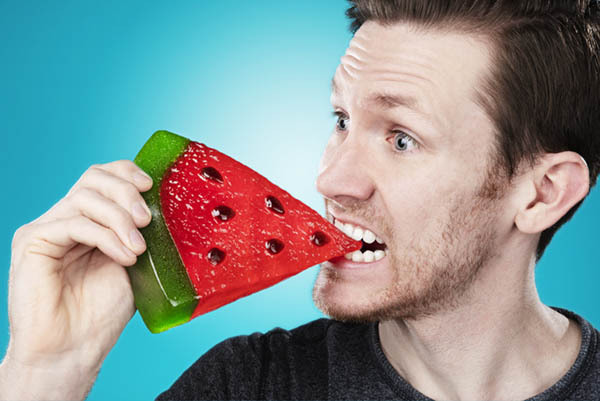 Jon and Joey, members of the Vat19 video team, take a first look at this candy watermelon slice. Jon and Joey take a first look at the Gummy Watermelon Slice. Question: This gummy looks different to me. Is my glass eye playing tricks on me again? Answer: Good catch! To better resemble the look of watermelon, the surface of the Gummy Watermelon doesn’t have the same smooth uniformity as our other gummy. As a result, it’s not quite as dense to chew. Question: What’s in this thing? Answer: The ingredients are: Corn Syrup, Sugar, Gelatin, Citric Acid, Sorbitol, Natural & Artificial Flavors, FD&C Red #40, Blue 1, Yellow 5, Yellow 6, Titanium Dioxide, Vegetable Oil, Carnauba Wax, Canola Oil, Lecithin from Soybeans, Water, Rosemary Extract. Please note that Gummy Watermelon is not vegan, kosher, or halal.